The morning crowd hustles to buy their wears at Kalupur Market. Tucked away under an overpass and behind large buildings on the main road, the Kalupur fruit and vegetable market in Ahmedabad hums with busy bodies before sunrise. As the light filters in, one sees silhouettes of men pushing heavy carts leaden under the weight of fruit and vegetables. Women walk briskly, weaving through the crowd as they balance large burlap bags bursting with produce on their heads. 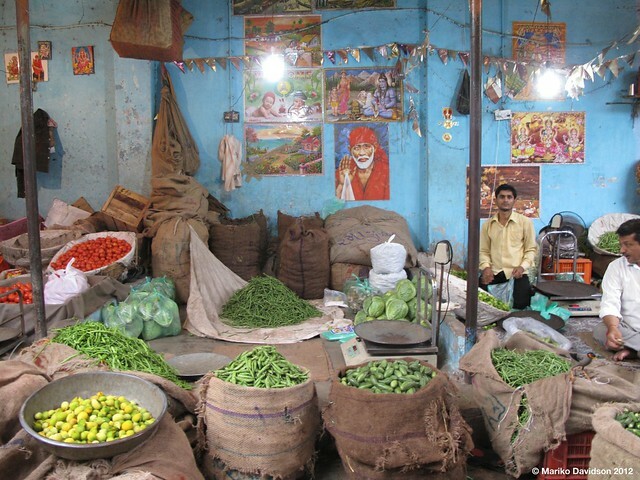 Like so many others, this is where Rajeev buys green chilies every morning to prepare for the day ahead. Rajeev has lived in Ahmedabad for the past 45 years, earning his living hawking chili peppers. His tale is a familiar one about the tension between public and private space, and the formal and informal economy. For 20 years, he sold his chili peppers in the Civil Hospital area. Recently it has become more difficult to sell his peppers in this part of town. He works longer hours, competition from other hawkers has increased, and his costs are rising; but he nets the same profit. Due to tensions over space, street vending/hawking is in a legal gray area in Ahmedabad; yet it’s how thousands of people earn their living. Although the Ahmedabad Municipal Corporation (AMC) recently formed a Town Vending Panel to implement their Street Venders Policy, the results are still waiting to be felt on the ground. Government has made moves to provide an official vending space, but with no designated zone as of yet, venders are still vulnerable because they are forced to wander to avoid trouble with the police. 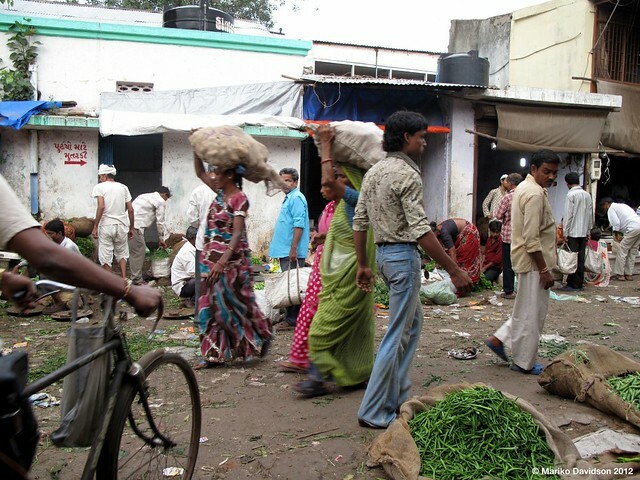 At Kalupur Market, vegetable stands sell produce in bulk to venders. Ten years ago, Rajeev had his cart taken away by the police for the first time. It cost him Rs 2,000 (US $37) to get his cart back. After the 2008 Ahmedabad Bombings – when 49 people died and another 145 were injured from bombs detonated at 16 different locations, including the Civil Hospital – government tightened security. They erected barriers along the sidewalks and prohibited hawkers from selling their wares in this area. For hawkers, sales and profits decreased as police enforcement increased. Rajeev couldn’t afford to find a new location to sell his goods so he continued to sell his chili peppers outside the Civil Hospital. He stands directly on the road, just off the sidewalk. Recently the police confiscated his cart a second time. He paid Rs 1,000 (US $19) to get it back. This is not a minor fee. Rajeev only nets Rs 150 (US $3) per day after profits. He has five sons. After paying for food, shelter, and education, Rs 1,000 works out to 22% of his monthly take home income. At this point in his story, Rajeev suddenly became agitated and said he’d run out of time. He walked off at a brisk pace, weaving through the crowd with his bag of chilies. Overhearing Rajeev’s story, a woman by the name of Udayaben began to talk about the difficulties of hawking. Wearing a bright red sari, she stood a full head higher than most of the other women at the market. Udayaben carried herself well. She got into the vegetable-hawking business because of the low start up costs, the (once) decent income, and because no formal education is needed. Like Rajeev, Udayaben faced growing competition within the market and experienced violence by the police. She once tried to stop the police from beating a colleague of hers. When she intervened, they turned their batons on her and beat her too. “We are always moving and if police come, they tell us to move and if we don’t move, the police hit us.” She brought her grievance to SEWA, the Self-Employed Women’s Association, and they helped her talk with police. In an effort to start a dialogue between street venders and the government, SEWA took up their case and began to defend them to government. They asked government to negotiate with the venders rather than expel them, confiscate their belongings, and fine them. The police, in turn, complain about the litter they say is generated from vending and the fact that vending is still in a legally grey area. A vegetable hawker paces her route to sell to her goods to her regular customer base. It all comes down to the legality of place. According to WIEGO, Women in Informal Employment: Globalizing and Organizing, 65% of non-agriculture employment is within the informal sector in Asia. Hawking is a huge portion of the informal economy. 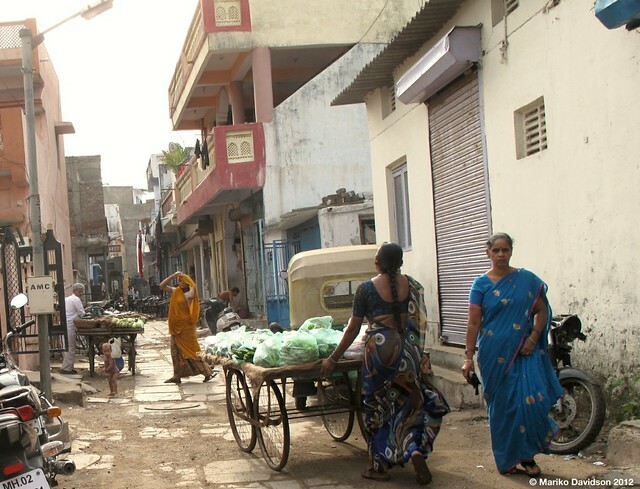 The former policies in Ahmedabad formally excluded many entrepreneurs who depend on space and access to make a living. There are many consequences for not being able to stay in one place; and hawkers are constantly moving and on their feet. Though they have their set routes, if a customer misses a vender, it can be difficult for the customer to find that vender again, making it difficult for them to build a customer base. Additionally, they are on their feet moving all day which is particularly exhausting in the summer heat (115°F) or monsoon season with all the excess rain and mud it creates. 8. Stop the confiscation of goods. Since then the AMC has taken some significant steps to implement a Street Vending Policy. In September 2012, the government confirmed that electronic identity cards will be provided and vending zones will be allocated. There is no word on whether government authorities will stop the harassment and violence against street venders. How these policies are implemented, disseminated, and enforced is of critical importance. Who will get the identity cards? At what cost? Who decides and where will the vending zones be? Will venders be able to continue to sell to their client bases, or will this critical relationship be disrupted? At this time, it is unclear whether these policies will be another step that further marginalizes an already vulnerable community, or will ease some of the challenges of vending. Mariko Davidson is a master’s in city planning candidate at MIT’s Department of Urban Studies and Planning. This article came out of Street Stories, an independent art project she launched this summer while working at ITDP in Ahmedabad.